Heading cross-country from Chicago in Dad’s old Honda Prelude, we’re no further than Wisconsin on the first day when Jonah turns from the passenger seat and tells me he’s working on something. We were driving my dad’s old car from Chicago to Los Angeles. It must have been the second day of driving–we were past Minnesota. It’s rare when a filmmaker confirms hypotheses put forward by critics. But that seems to have happened to us. An enormous amount had been written about Inception, both on the internet and in print, before we wrote our blog entry last week. For the most part, we avoided reading about the film, fearing spoilers and statements about the film that might influence our own initial take on it. Since then, we’ve read Jeff Goldsmith’s in-depth interview with Christopher Nolan published in Creative Screenwriting (not yet available online). There Nolan broaches several ideas about his approach to the film, and some of those square with our analysis. Today we highlight a few of those remarks and tease out their implications. We end with comments from some readers. My contribution to last week’s entry concerned the film’s dependence on nearly continuous exposition, which I thought of as a major formal device across the film. In the Creative Screenwriter interview, Nolan says that exposition was a particular concern of his in making the film. Usually in a heist film we get a big dose of exposition as the team’s leader explains the plans for the crime to his colleagues. Then we watch the plan unfold, with exposition added well into the film as needed. In Inception, however, the heist explanation becomes nearly continuous. Goldsmith comments, “Nolan smartly flipped this conceit on its head and instead of keeping the audience at a distance, he decided to take them along for the entire ride. The subtle re-configuration allows for the audience and the characters to sweat together whenever any hiccups arise in the well-thought-out plan.” In fact, the “well-thought-plan” unfolds only as we watch the film. The implication here is that the audience becomes involved in the plot not through learning about the characters’ backgrounds and traits, as most spectators seem to expect in standard Hollywood films—even blockbusters. Instead, our relationships with the characters (apart from Cobb) come through learning new information along with them and being attached so closely to them while they work through the mechanics of the plot. The result, at least for many viewers, seems to be a feeling of dissatisfaction at not being able to get close to the characters in a more conventional, detailed way. The advantage, if one wishes to consider it as such, is that we are forced into a struggle to understand the workings of the plot. Yet we are not entirely with the characters in their achievement of the mission, because we move back and forth among the levels of the dream, as none of them does. Thus we may be attached to the characters in the parceling-out of exposition, but we know much more than they do at any given moment once the second dream (the hotel) begins. The result comes through further experimentation on Nolan’s part, this time with intercutting. 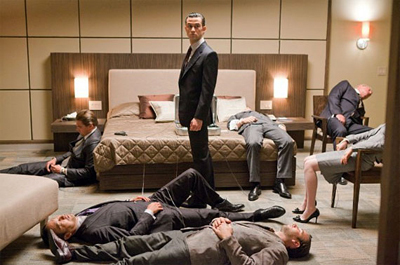 In our earlier entry I argued that Inception uses the dream subject matter to set up a heist plot and to motivate a pattern of embedded narratives. Normally, embedded stories are presented as sealed off from one another, like concentric circles. One interest of the film, I thought, lies in the freedom with which Nolan crosscut among these nested tales. After further reading and re-viewing, I’m forced to ask: Which is the real center of his interest–embedded stories or crosscutting? And this question leads me to think about his development as a filmic storyteller. For Nolan, I think, form has centrally to do with the sorts of juxtapositions you can create by crosscutting. You could say he treats crosscutting the way Ophuls treats tracking shots or Dreyer treats stark decor: an initial commitment to a creative choice, which in turn shapes the handling of story, staging, performance and other factors. Moreover, his fondness for crosscutting favors actions taking place in different time frames. Traditionally, a crosscut sequence switches between lines of action taking place at the same time. While Smith walks his dog, we see Jones stalking Smith’s wife. The Dark Knight has many sequences that crosscut simultaneous lines of action. When crosscutting isn’t presenting simultaneous actions, it’s often alternating between present and past. An influential example is Hiroshima mon amour, in which the female protagonist’s memories of occupied France are juxtaposed with her visit to Hiroshima in the present. Here, as often happens, the switch to an earlier time is motivated as a character-based flashback, an expression of the persistence of her memories. Nolan’s interest in crosscutting various time frames doesn’t quite square with tradition. He was much influenced by Graham Swift’s 1983 novel Waterland, as he has pointed out over the years. Here is what he says in the CS interview. What initially intrigued Nolan, it seems to me, is the idea of taking a story that could be told in straightforward chronology and breaking it into two or three discrete phases. He then cuts among scenes within the phases, without motivating the shifts as character-centered flashbacks. The story of his first feature, Following, could have been told in 1-2-3 order. Instead, within a framing situation of an interrogation, the plot breaks the protagonist’s tale into three phases, all quite close in time, and then cuts among them. Within each phase, the action is chronological (so far as I can see), but the three “eras” are intercut. Nolan is careful to keep us oriented as to which time zone we’re in through things like the protagonist’s appearance (sloppy, well-groomed, bruised) and a burst of black frames that signals a shift to a different zone. Eventually all three phases get linked up, so, for example, the last thing we see of phase one leads smoothly to what we saw as the first imagery of phase two. The same concern to break up a linear story is at work in Memento. Again, different phases of the same tale are intercut. But now a forward-moving module is accompanied by one moving backward. Again, these are kept distinct through time markers (color footage vs. black-and-white), and the reverse-chronology one is filled with tokens and echoes that remind us that what we’ve already seen actually took place after what we’re seeing now. The Prestige expands crosscutting in another direction. Christopher Priest’s original novel is based on the discovered-manuscript convention. Adam Worthy, a publisher, begins reading a book by Alfred Borden, Secret Methods of Magic. What follows are several other memoirs, treating events at different points in history, with some going back as far as 1866. These texts are not intercut or even nested. They stand as solid blocks, presenting overlapping time schemes and varying points of view on the central rivalry between the two conjurers Borden and Robert Angier. For the film of The Prestige Nolan and his screenwriter-brother Jonathan again create a basically linear chronology. Once more it is fractured into discrete phases. There is a present (Cutter showing a bird trick to the little girl Jess), the recent past (Alfred arrested for killing Robert and awaiting trial), a more distant past (Robert visiting Nicolai Tesla in Colorado), and thanks to Alfred’s journal, the most remote days when the two became competitors and Alfred created the Transported Man illusion. But The Prestige treats its time zones somewhat as if they were embedded stories. I think that this is partly because we have two protagonists and a split point-of-view pattern. The biggest cue, however, is the way that the Nolans absorb the discovered-manuscript convention into the film. In a classic embedded structure, a character recalls or recounts a string of events with its own integrity, and sometimes the frame story involves a character reading a letter or memoir. In the film, this situation is provided by journals kept by the rival magicians. Now Nolan can cut freely among nested stories. At one point we have Alfred, jailed for murder, reading Robert’s journal, in which Robert tells about reading Alfred’s journal in Colorado. Alfred’s version of events is embedded in Robert’s version, which is in turn embedded in the moment of Alfred’s reading in prison. Moreover, instead of Following‘s rather mechanical demarcation of phases (black frames signal a shift between phases), the narration of The Prestige is quite fluid, joining distant periods through smooth hooks of imagery and sound. Sometimes the sound comes from one period but the shots are in a distant one. We’re introduced to this strategy in the very opening: Cutter’s voice-over is in the present, but the image is two layers into the past. So it seems to me that in The Prestige Nolan’s interest in crosscutting different timelines became more audacious, working with not only linear events but embedded stories. The interest in nested stories emerges much more explicitly in Inception, as I suggested in the earlier post. But what I didn’t see then was that using dreams to motivate embedded plotlines changes the time game. A dream within a dream can’t be said to be taking place earlier than the surrounding dream, the way a flashback or discovered manuscript necessarily presents past events. The dream realms can’t be ironed out into a chronological structure as the phased plotlines of Following, Memento, and The Prestige can. In fact we find our old friend simultaneity at work among all the phases (dreaming while dreaming while, etc.). And Nolan’s film invokes the convention of the climactic deadline (actually, four of them). So in a perverse way, Inception‘s formal gambit is more traditional than the time-scrambling of the earlier films. But because we seldom see embedded stories intercut, the result is also pretty daring–something akin to that abstract filmic time that Griffith creates by intercutting four historical epochs in Intolerance. From this perspective, Inception marks a step forward in Nolan’s exploration of telling a story by crosscutting different time frames. You can even measure the changes quantitatively. Following contains four timelines and intercuts (for the most part) three. Memento intercuts two timelines, but one moves backward. Like Following, The Prestige contains four timelines and intercuts three, but it opens the way toward intercutting embedded stories. The climax of Inception intercuts four embedded timelines, all of them framed by a fifth, the plane trip in the present. For reasons I mentioned in the previous post, it’s possible that Nolan has hit a recursive limit. Any more timelines and most viewers will get lost. What can he do next? I really appreciate and agree with the idea that the motivation for the film is to tell nested or embedded stories, with the shared dreaming device essentially as a framing convenience rather than thematic imperative. One parallel I was surprised D&K didn’t raise was with the embedded narration of The Prestige. I teach the latter in my narrative theory course as a case study specifically to explore how the film plays with storytelling levels, with the dual journals/letters, voice-over, flashbacks, etc. Inception makes this layering more literal in terms of parallel worlds, but I do see some important precedents forged in Nolan’s earlier work. I agree with Jason’s suggestion about The Prestige and decided to develop the point he suggested. I didn’t dwell on the film in the earlier entry beyond noting that it’s discussed at some length it in the ninth edition of Film Art: An Introduction. It’s good to know that Jason (who maintains an excellent blog here) finds the film a lively way to introduce narrative concepts in his teaching. Jim Healy pointed out another example of a film with several nested story lines. As for complicated embeddings since The Matrix, I was a big fan (maybe the only one) of Carpenter’s Ghosts of Mars, which has, I think, a flashback within a flashback, within a flashback, within a flashback. You might consider looking at Matthew Barney’s Cremaster 3, or at least the segment available on DVD called “The Order.” “The Order” has simultaneous action on 5 different levels of the Guggenheim Museum. If you watch it linearly, it seems very much like a video game, as the protagonist has to achieve certain goals on each level. The DVD also gives you the option, however, of toggling between the different levels across the duration of the segment, so that even if the protagonist isn’t on level 1, you can watch level 1 (there was a variation on this for the multiple-screen video installation version of the piece). “The Order” itself is nested within the larger narrative of the protagonist (Barney, the “Entered Apprentice”) working his way up the Chrysler Building to confront “the Architect,” and there is a parallel between the climax of the Order and the climax of the action with the architect. The website synopsis describes “The Order” as a “choric interlude,” and even though the Barney character is called the Entered Apprentice in the both the larger and nested narrative, the nested version is a “fantastical incarnation” of the character. But there’s nothing to mark it explicitly as a dream or the subjective experience of the character (as far as I can remember). The two versions of the character are instead connected by the fact that Barney plays both of them and by certain motifs (he loses teeth in the larger narrative, he has a bloody mouth in “The Order”). In any case, it might be a useful example if you return to the idea of narrative strategies within a nested structure. “The Order” also has various thematic connections with the other films in the series (each level in the Guggenheim references the 5 films in the series) so that this “middle film” both looks back and looks forward to the other films in the series. It was released last. Jim’s reference to Barney’s Cremaster series reinforces our sense that Nolan is exploring some avant-garde techniques but anchoring them in familiar genres, plot patterns, and the like. Motivation, in other words. In Memento Nolan needs to keep the audience as clueless about the recent past as Leonard is, otherwise this identification is lost. The only way to do this is with the looping reverse form that was used. All the other aspects of the conceit flow from this necessity. I seem to remember interviews in which Nolan talked about trying to find the technique required to tell this story, and how everything fell into place when he did. But even if it was reverse-engineered, even if the filmmmaker simply wanted to make a fractured-time narrative and needed a story – any story – to tell, I think story and storytelling in Memento (of anterograde amnesia in the protagonist and a looping reversed chronology) are perfectly and elegantly matched. I find David’s point persuasive. It illustrates how an overarching formal commitment confronts you with a cascade of obligatory choices, and how those choices can be motivated. If you want to restrict the plot to Leonard’s range of knowledge, you have a problem because he forgets what happened to him a few minutes before. Then our knowledge will always be greater than his, creating a very externalized, objective narration. In other words, if the events are told chronologically, then we see what Leonard will soon forget. But a reverse-order plot suppresses our knowledge of the recent past, thus approximating the character’s range of knowledge in any particular scene. This creates a new problem to solve, however, because we now still have knowledge outside Leonard’s ken—knowledge of the future story events. For instance, we know that he will be betrayed by Natalie and will shoot Teddy. Yet in a way our future knowledge doesn’t hurt the plot’s unfolding, because this is a film noir. In a noir we often sense that harm is destined to befall the protagonist. This sense of fatality is sometimes specified by a frame story anticipating the protagonist’s end, as in Double Indemnity and Sunset Boulevard. Here, instead of using a flashback, Nolan conjures up the doom scenario by reverse-order presentation. Motivation again, this time by that quasi-genre we call film noir. Would the structure work so well with a Western? Like Inception, Memento finds a structure that meets Hollywood’s demand that the presentation be motivated by appeal to genre and character psychology. A good counterexample is provided by Gaspar Noë’s Irreversible, in which the 3-2-1 ordering of scenes isn’t justified by such factors. As often happens outside Hollywood, a play with form doesn’t need such motivations–or alibis, if you like. The Nolan brothers’ memories of Memento are taken from Christopher Nolan, Memento and Following (London: Faber, 2001), p. 233. In the same volume (pp. 97-99), Nolan offers some comments on structure echoing those we quote here. The remarks on Inception come from Jeff Goldsmith, “The Architect of Dreams,” Creative Screenwriting (July/ August 2010), 18-26. CS is well worth subscribing to, and its free podcasts are very informative. On Memento, Andy Klein’s careful reconstruction from 2001 remains admirable. On Christopher Priest’s reaction to the film version of his novel, see The Magic: The Story of a Film; see also our entry here. For a discussion of the sort of audiovisual hooks Nolan employs in The Prestige, see this web essay. Another entry on this site considers Nolan’s visual storytelling in The Prestige. We also have a post discussing Barney’s Cremaster project. P. S. 31 August: Who can keep up with all the Webchurn on Inception? We won’t try, but simply point you to two reactions that pictorialize the embedded-dream device: here and here. Scientific American weighs in on lucid dreaming. And again here. aesthetics of slow motion — he’s never known what it’s best used for. by” (my paraphrase) the narrative to cut parallel action like this. plausibles, and their Body Snatcher infiltration of audience mores. with the classic cinematic device of slow motion! Thanks to Sean for his comment. This entry was posted on Thursday | August 12, 2010 at 11:46 am	and is filed under Directors: Nolan, Experimental film, Narrative strategies, Readers' Favorite Entries. Both comments and pings are currently closed.